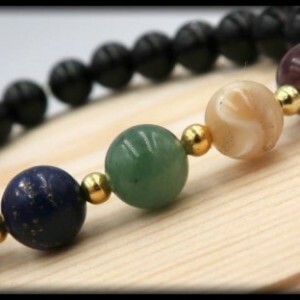 Attract love, inspiration, and cleanse your heart with this aphrodisiac accessory! Beautifully made of Pink Tourmaline for the heart chakra and Black Tourmaline for the root chakra. With the Pink Tourmaline, it will aid you in promoting peace, relaxation, and connects you to compassion; All while attracting love and inspiring you to love. The incredible Black Tourmaline aids in you problem solving and understanding others. Since Black Tourmaline has similar attributes to Pink Tourmaline, it also promotes a laid-back attitude and removes stress. 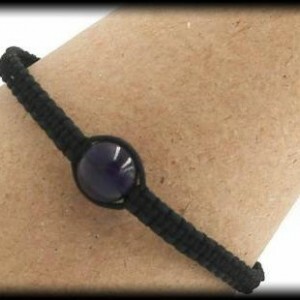 It attracts inspiration, disperses negative energy, and balances your chakra system. Why not gift it for your lover, or the lover in you? This item contains 8mm beads Pink Tourmaline and Black Tourmaline. SIZING INFORMATION Please measure your wrist with a measuring tape to ensure the most accurate measurement. If you do not have a measuring tape, you can also use a string by wrapping it around your wrist and then cutting the piece of string. After you have your cut string, place it alongside a ruler and write down your measurement. To ensure a perfect fit, please had 0.5 inch to your wrist measurement, if you want a little room please add .75 inches to your wrist measurement.